The saddle Dune I allows a use more specifically adapted to the dressage. 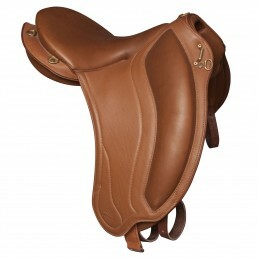 The leg rolls have been slightly pushed back and thus fix the leg in a more upright and downward positionDemo 2012 Dune I saddle with walnut seat, natural flap and walnut pipping. The right pace ! this is Gaston Mercier’s philosophy. Our products are designed to meet your needs whether you are a professional, a beginner, a trail rider, or a horse whisperer… everyone who, at his or her own pace, engages in an equestrian practice. Gaston Mercier, who is not excessively inclined towards the rigid codes of tradition, invented the coloured saddle. And a whole range of girths, stirrup leathers, socks, bridles, covers and saddlebags that awaits you! Ideal for mixing the practical with the enjoyable.